It's three startling Terrifics tales, kicking off with a deadly nightmare at Stagg Manor! 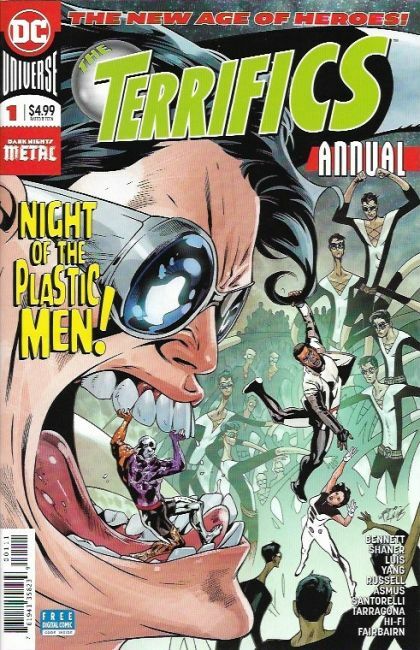 When a plot to steal Plastic Man's powers goes awry, the Terrifics' new home and everyone in it are at the mercy of stealthy plastic monsters. Looks like Sapphire picked the wrong day to host a Halloween dance for her Stagg Industries internship program! Next up, discover the secret origin of Java the caveman, and the secret he's keeping will shock you. Last but not least, we uncover Tom Strong's hidden adventure in the Dark Multiverse, hold on to your holy socks!